It was March 2005, and the NHL's owners didn't know what to do. It had been six months since they'd locked out the players' union, trying to force concessions, but the players were still refusing to bear the brunt of spending cuts. Two weeks earlier, the league had finally canceled the already-delayed season. No money was coming in, and none would be. For the first time since the Spanish Flu epidemic of 1919, no Stanley Cup would be awarded. Now commissioner Gary Bettman told the owners that their meeting would have a visitor, from outside, who had something to say to them. The visitor came in with a number and a proposal: For $3.5 billion, he said, he was willing to purchase every single team in the league. His company, Bain Capital, wanted to buy the entire NHL. Since its founding in 1984, Bain Capital had been swooping down on struggling businesses, buying them out with cheap debt, and using austere management to make them profitable—for the private equity firm and for Mitt Romney, the former partner whose 10-year retirement agreement would continue to pay out profits through 2009. What the businesses were hardly mattered. Bain's holdings have included AMC Theaters, The Weather Channel, Toys "R" Us, Burlington Coat Factory, and Burger King, companies with nothing in common beyond the potential profits Bain saw in running them its own way. And now, Bain saw a chance to buy low on professional hockey. The Toronto Star reported that on March 1, 2005, Bain Capital managing partner (and Boston Celtics co-owner) Steve Pagliuca, accompanied by Bob Caporale of Game Plan LLC (which specializes in facilitating sales of sports franchises), made a presentation at an owners meeting in New York. They had been invited specifically by Bettman. Bill Daly, the NHL's chief legal officer, said afterward that "when someone's offering over $3 billion, we felt we had an obligation to the board to have them, at least, hear it from the proposed purchaser." In his biography of Bettman, Jonathon Gatehouse wrote that Game Plan "looked at the NHL and saw a business that could make a lot of money, but not with thirty different bosses. The idea that they sold to Bain would have left individual club management in place, but seen the league set the payrolls, collect the revenues, and pay all the bills." Fast-food franchises, if you will, with extremely limited autonomy. "It's taking the National Hockey League and its 30 teams and operating it as any large corporation does," Caporale said in an interview at the time. "With each team essentially being a division of one company." Getting the $3.5 billion would have been something close to child's play for Bain. Those were the peak years of a private equity boom, with firms raising $159 billion in 2005 alone—-nearly eight times as much as in 2003. How seriously the owners took on the offer isn't known. "They actually clapped at the end of the presentation," Caporale told Businessweek last month. The owners who spoke out at the time sounded much less enthusiastic. "I don't think it's realistic, and I don't think there's much interest, and I know there's no interest on the part of the Bruins," said Boston owner Jeremy Jacobs. Florida Panthers owner Alan Cohen said he "didn't give the offer a second thought." Even Philly's Ed Snider, pushed to the brink in labor talks, could only laugh. "You couldn't get 30 guys to sell their teams," he said. "You could go to the moon in a two-engine plane quicker than you could do that." There were two very good reasons why NHL owners were hesitant to consider Bain's offer, only one of them purely economic. First, the offer price was too cheap. Before the lockout, Forbes had valued the league at about $4.9 billion. The $1.4 billion shortfall was too much for the owners to take, collectively. "Obviously, they came in way too low at $3.5 billion," Jeff Vanderbeek, who had bought the Devils outright just 12 months earlier, after resigning from Lehman Brothers, said at the time. Bain promised to allow the owners to decide how to divvy up the money, meaning that they would have had to choose among themselves who would be the most shortchanged. One possible result: The higher-revenue teams—Toronto, Detroit, Boston, New York, and company—could have bolted to form a compact rival league, an update of the Original Six, competing for talent and audience with the gutted remnants of the NHL. The second reason the deal didn't get far was the potential outcome of any leveraged buyout: The realization that Bain, freed from sentiment and the restraints of a 30-team league, might have been able to run the NHL's business better than the NHL did. If you're looking for inefficiencies to eliminate from pro hockey in the name of running a lean, mean operation, the owners are the place to start. The unsentimental analysts at Bain had exposed the uncomfortable fact about NHL lockouts, then and now: They're proxy wars between big markets and small markets. The time frame for Bain Capital to make the NHL profitable and sell it off would not have been long—roughly the length of the loan the firm would have taken on to finance the buyout. The ultimate goal would have been to pay off the creditors and sell a league no longer carrying debt. For "senior" secured debt, that's five to seven years. For the more expensive and risky "subordinated" debt, it could have been 10 years. Bain would have had to act quickly and decisively to turn a league losing nearly $300 million a year into an attractive purchase. Of all the tools at a private equity firm's disposal, says Donna Hitscherich, director of the Private Equity Program at Columbia Business School, the most effective is the personnel lever. Cut jobs, cut salaries, cut costs. When Bain bought the tech company Interpath in 2000, the first step in cost-cutting was to lay off 70 percent of employees within 60 days. But the NHL offered a unique challenge to the standard way of doing business. "Private equity firms tend to stay away from companies with a strong, unionized work force," Hitscherisch says. "It's harder to make major changes." Still, Bain was interested. One theory holds that just by virtue of the purchase—turning a league of 30 different owners into a single entity—the firm would have fundamentally changed the legal standing of the NHL with respect to the union. There is a precedent: In 2000, players brought an antitrust suit against Major League Soccer, alleging collusion in player salaries. It was quickly tossed out of court. MLS could not have conspired to restrain players' salaries, the jury decided unanimously, because it was conspiring with itself. It was a single company, competing in a global marketplace—exactly the structure Bain proposed for the NHL. A similar squeeze, if it had come to pass, could have radically transformed the NHL. With contract offers artificially lowered, European stars and the cream of the domestic talent would presumably go off to Europe for more money. The league would fall back from its warm-weather beachheads and dreams of national appeal; perennial money-losers like the Islanders, Sabres, Blue Jackets—hell, a third of the league hasn't been profitable in years—might be contracted out of existence. The game might have reverted to a regional pastime for the diehards of the North and Northeast, a feeder league drawing only enough for the league to pay off its debt. But the National Hockey League is not your average business, and Bain would have been unlikely to apply full-on slash-and-burn private equity tactics, as popularly understood. "If you're really cynical, the only aim is to hit the ROI threshold," says our source. "But even then, they know they're not going to get a return by gutting the things that made the investment attractive in the first place." Rather than cost-cutting its way to a skeleton NHL, Bain might have focused on shaping a more efficient league, one that could have been sold for more than $3.5 billion. And it's hard to argue that the NHL of today is anything close to efficient, not with 30 teams competing against each other for limited spoils. Take Shea Weber, who just signed a 14-year, $110 million contract to stay in Nashville. That's $30 million more than it cost to start the Predators franchise in 1997. Foolish spending that the team can't afford, yet they were bullied into it by an offer sheet from Philadelphia that Nashville had to match or lose their franchise player. That's a free market at work—great news for Weber, but terrible for a league bent on cost control that sees its teams driving up the prices on each other. "You'd never see anything like Shea Weber's deal" in a Bain-owned league, says Brad Kwong, the former managing director of NHL Europe and currently a managing director at private equity firm Harbinger Capital, and part-owner of the USHL's Dubuque Fighting Saints. "You'd never see teams bidding against one another. There'd be no reason, because everyone would be spending from the same pot." On the revenue side, the league's biggest tool for chasing money is franchise movement. But it's not so easy as packing up the underperforming Coyotes and setting them down in Hamilton. Again, the biggest hurdle to a flexible, efficient league is the owners themselves. As things stand now, leagues make every effort to help struggling owners; they don't blackjack them out of their teams. "If prospective owners see that," explains the source with CBA experience, "they won't be so willing to buy in." There's a problem on the other end too. Existing owners are fiercely protective of their territories, for good reason, and no matter how fertile their local market, they don't want the competition. But if owner autonomy is hamstrung, the pieces are freed up to be rearranged at will. Remove the owners, remove the problem. "If you owned the entire league, you'd put another team in Toronto, and it would probably be the second most profitable team in the league," says Kwong. "If Bain owned all the teams, it'd be as easy and make as much sense as putting multiple Starbucks in a two-block radius in Manhattan." Teams would move to where they'd be instantly profitable—Ontario, Quebec, Massachusetts, Minnesota. What would that mean for the Sun Belt teams? "We know off the bat there are teams that don't belong where they are," says our source. But Gary Bettman's commitment to nontraditional markets isn't quixotic, and it has two primary aims—both, believe it or not, for the practical long-term good of the sport. The first is all about television. When the NHL signed a $2 billion TV deal with NBC, it was able to point to its footprints in some of the largest markets in the country. Dallas, Phoenix, Tampa-St. Pete, and Miami all rank among the top 16. It's possible that the league's penetration in these markets makes up for the teams' financial woes. The second reason the NHL doggedly clings to warm-weather spots may not become apparent for decades. If kids are going to get into hockey, they require exposure to it at a young age. For most of sport's history, the vast majority of American players came out of hotbeds in Minnesota and Massachusetts. That's starting to change, yet the talent pipelines in California, Texas, and Florida remain largely untapped. Giving them local NHL teams and the associated fan experiences and youth programs is the only way to open up the most populated parts of the country. This is Bettman's ideal. There would have been zero incentive for Bain to continue to seed the desert, because it wouldn't matter to them—or to whoever bought the league 10 years later—if Texas high schools are hockey powerhouses in 2030. "It's a tremendously long-term, slow-growth strategy," says Kwong. "A grassroots way to grow the game. But because Bain is primarily financially motivated, they're going to make decisions that aren't in the best interests of the sport's future." Therein lies the issue. A private equity firm makes its purchase with cheap debt, and from that moment, its sole responsibility is to its investors. If you believe sports should go beyond the bottom line, a stripped-down NHL would be a coldly calculated slap in the face. Yet the NHL, bloated with too many teams and too much money locked up in too many megacontracts, could use a little cold calculation. If you were to build a league from the ground up, it would probably look much like what Bain would have come up with—central control, with franchises located only in anchor cities. It's antithetical to the bigger-bigger-bigger mentality of pro sports, a gigantism that afflicted even the NHL, which expanded too fast and is now trying to pass those growing pains onto the players. But a smaller league, running unspectacularly in the black, would have managed to drop the pucks on time this season. In the end, the private-equity takeover never received more than lip service. It's likely Bettman brought Bain Capital into the board meetings as a scare tactic, a threat to the union during a deadlocked negotiation. But the prospect of a leveraged buyout should have scared everyone involved, not just the players. The owners let the proposal wallow and returned to the bargaining table. Bain didn't give up. On May 21, they upped their offer to somewhere around $4 billion. Included were more specifics about how the money would be allocated—this time, the more profitable teams would be guaranteed a larger slice of the pie. The split was stunning. The 10 richest teams would share $2.25 billion. The next 10 would have to split $1 billion. And the 10 worst-run teams would have just $750 million to themselves. The unsentimental analysts at Bain had exposed the uncomfortable fact about NHL lockouts, then and now: They're proxy wars between big markets and small markets in which the owners try to wring money out of the players instead of one another. Bain merely put a dollar figure on the divide, and its streamlined NHL would have done the dirty work that the league could never bring itself to do: eliminate those small markets altogether. "If you remove the conflicts between large- and small-market owners," says our source with collective-bargaining experience, "doing things for the good of the league—even at the expense of one franchise—becomes a lot easier." But Bain's increased offer was too late. Just a few days before, the owners and players had met in New York for revived talks that both sides were eager to report as constructive. They had agreed, informally, to meet every week until a deal was done. From that point, an end to the lockout seemed like a matter of when, not if. By July, the deal was finalized. It included the league's first ever hard salary cap—long on the owners' wish list, yet a direct heritage of the Bain plan. Bain moved on; it had spoons in many pots. A week after the end of the lockout, Bain Capital announced plans to take over Dunkin' Donuts. A donut franchise is the same as a struggling tech company is the same as a North American hockey league. They are all businesses that Bain believed to be poorly run and potentially profitable in the right hands, and hopefully available on the cheap because they were desperate. The NHL, it turns out, wasn't that desperate. 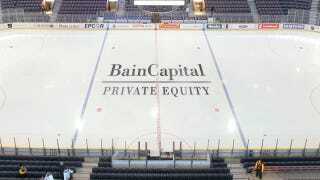 Private equity still has a major legacy in hockey. Later in 2005, Bob Caporale and Game Plan shifted gears, attempting to broker Dave Checketts's purchase of the St. Louis Blues. Those talks stalled, but a year later Checketts returned—backed by private equity firm TowerBrook Capital Partners. TowerBrook kicked in about $105 million, for 70 percent ownership. The Blues have regularly spent at or near the salary floor, and this past spring TowerBrook sold its controlling shares for somewhere near $130 million. Phil Falcone, founder of Harbinger Capital, bought a 40 percent stake in the Minnesota Wild in 2008. When Maple Leaf Sports & Entertainment went up for sale last year, the equity firm behind the YES Network expressed interest. Greg Jamison, the latest suitor of the Phoenix Coyotes, is struggling to raise equity, and it's expected that outside investors would provide the bulk of the purchase price. If private equity couldn't take over the NHL all at once, via Bain, then maybe it could do it piecemeal, a team at a time. This falls in line with the prevailing trends in sports ownership. The ownership class of the 21st century increasingly comprises businessmen for whom teams are another means of generating wealth, a small corner of a big portfolio. This, then, is the lens through which to view the current lockout. It's a desperate action by owners who are concerned not that their investments are losing money year to year, but that their investments won't look so attractive when it comes time to cash out.